Throughout his time as a Senior Pastor, members of his congregation have asked Pastor David Stine many questions about the Christian faith, but there is one that he continuously hears: "How do you make contact with God and hear His voice?" In Hearing from God, Stine presents a five-step process based on the scientific method to help Christians grow in their ability to listen and hear God's voice. This Scripture-based guide includes a 40-day devotional with curated Bible passages, questions for reflection, ideas for personal worship, and two-way journaling-everything you need to receive God's message. Hearing from God is the perfect way for you to deepen your relationship with God and better understand His Word. 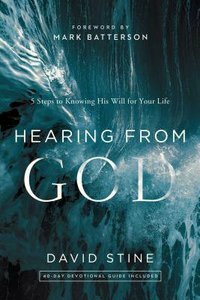 About "Hearing From God:5 Steps to Knowing His Will For Your Life"
Pastor David Stine is the Lead Pastor of DC Metro Church. He is known for his practical biblical teaching, his visionary leadership, and his desire to impact the DC Metropolitan area. He is honored to teach, train, and coach&nbsp; church leaders and future church planters. He earned his master's degree in practical theology and his doctoral degree in leadership at Regent University. Pastor Stine lives in the DC Metro area with his wife Taryn and their four children.